The Telegraph in the UK just reported today that Lexmark may be getting out of the Inkjet Printer business. According to the Telegraph, Lexmark, a US printer manufacturer, is to stop making inkjet printers to focus on other parts of its business. Why is this good news? Well, Lexmark (who also makes the printers for Dell), makes arguable the worst quality printers and ink cartridges on the market. According to a study that they themselves sponsored in order to "shed light" on failures of the remanufacturing industry, their own OEM (original brand) Lexmark Inkjet Cartridges failed out the box or prematurely at a significant rate. This also translates into more quality issues for remanufactured cartridges, because a remanufactured Lexmark ink cartridge is only as good as the components it starts with. Lexmark has also been strongly anti-refills, making their cartridges more and more complicated to refill, so an exit by Lexmark from the inkjet printer business would be great news for remanufacturers and consumers alike. HP and other printer makers have a much better quality product, and are more refill friendly. 123 Refills has announced the launch of its new “we need your empties” program. The program is designed to collect specific empty cartridges from customers that 123 Refills is developing refill solutions for. “Printer manufacturers are constantly releasing new printer and cartridge models, and 123 Refills is proactive in developing quality and affordable refill solutions for customers to fill their cartridge, or to offer a ready-filled remanufactured ink or toner cartridge. In exchange for the customer’s empty, 123 Refills offers a $10 coupon for use towards any order. 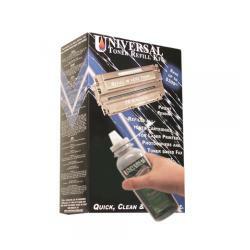 Uni-Kit has upgraded its toner refill instruction guide to version 7.0, expanding on the hundreds of laser toner cartridge refill kit instructions that it offers. The latest toner refill instruction guide can be downloaded here. All trademarks are property of their respective owners. Uni-Kit® has no association with any of the manufacturers listed here such as Hp, Epson, Lexmark, Xerox, etc. All logos and brand names shown here are used for identification purposes only. It is illegal to reproduce these instructions without written licensing consent from Easy Group LLC.